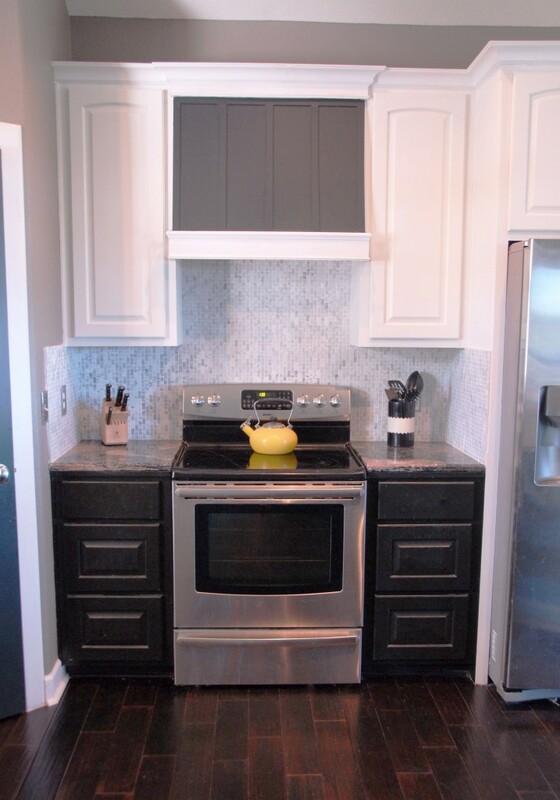 The good news is that along the way I've learned a few quick and easy ways to give your kitchen cabinets a custom look - without the custom price tag. Over the next few days I will share them with you, and hopefully inspire you to do the same to your own. The first update I wanted to share was building your cabinets up. I have seen a lot of tutorials showing you how to add height to your cabinets. Some do a little, others do a lot. Personally, I prefer somewhere in the middle - a height that looks good without being obviously "done." So let's get to it! Flat stock: 1" x 3" x 8' select pine. Backing trim: I used 2 inch scrap wood I had left over from previous projects. You may notice I didn't add specific amounts of stock, cabinet trim, backing and moulding. That is because it will vary depending on the amount of cabinets you have. Step 1: Attach backing trim. After removing the current crown, add a piece of backing trim to the top of the cabinets. The flat stock will be nailed to this piece of backing. I set mine back one inch (since my flat stock was 1 inch thick). To double check the fit, I placed the flat stock in front of the piece. Set flat stock in front of back piece to ensure the flat stock lines up with the edge of the cabinet. Once I confirmed the fit, I nailed the back piece to the cabinets. I opted to leave the flat stock in front to ensure the fit was good. 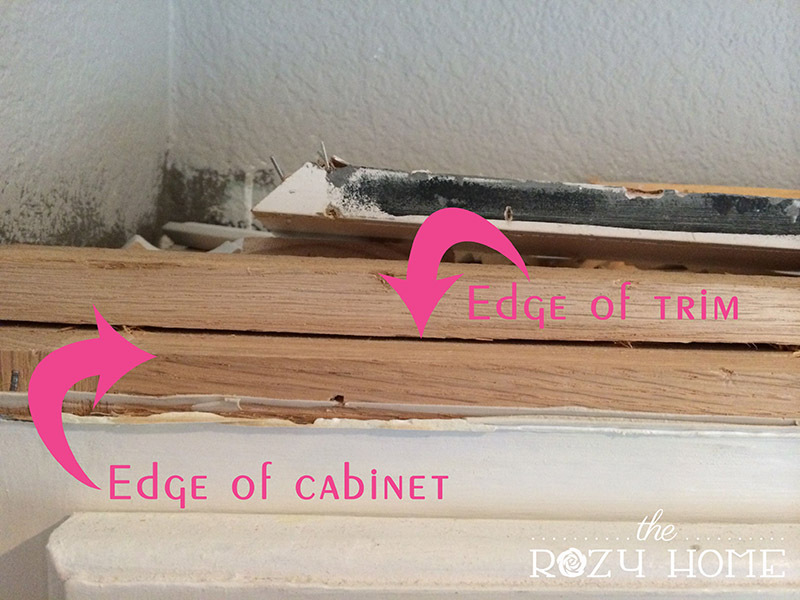 Do this along the entire length of the cabinets. Step 2: Attach flat stock. Attach the flat stock to the backing piece. Do this the entire length of the cabinets. Once you attach all of it, you may notice a small gap around the edges. No worries. Those gaps above are no problem because the next step is attaching edging around the bottom of the flat stock. Step 4: Attach the crown. I attached the crown 1 inch from the top of the flat stock. Next I used the same edging from the last step at the bottom of the crown. Doing this pulls the whole piece together and makes it look cohesive. This is where I get my hand slapped as a bad blogger. I had to take most of these pics on my cell phone because it's hard to use the big camera while standing on a ladder. Unfortunately, I accidentally deleted the pic of me attaching crown (so the pic you see is the final product). Step 5: Fill holes, sand, prime and paint. The last step is filling holes, sanding, priming and painting. And that is it! In only a day I was able to give my cabinets more of a custom feel using nothing more than flat stock and cabinet trim. In addition to the center cabinets, I have the cabinets over the refrigerator and two freestanding cabinets on an adjacent wall (I can't show you all of that yet because I don't want to ruin the entire reveal). $50. This cost includes the flat stock and cabinet trim. Flat stock: 3 pieces of 1" x 3" x 8' select pine. Cabinet trim 6 pieces of 8' cabinet trim. Backing. For the backing, I used 2 inch scrap wood I had left over from previous projects. Crown Moulding: I reused the existing crown.